Size of Male: 120 lbs., >32 in. Size of Female: 105 lbs., >30 in. 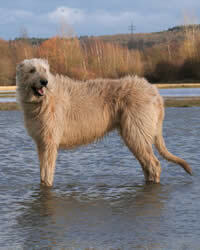 Undoubtedly one of the tallest dog breeds on the planet, the Irish wolfhound isn’t your typical big bully and hunter. The dog is rather sweet-natured for its size. You can even trust this loyal and kind dog to conduct itself amiably among strangers. The breed’s gentle facial expression suggests that the pooch makes a better home companion than a guardian. Ireland is easily recognized as the home of the Irish Wolfhound, but records indicate this dog breed existed as early as 391 A.D. in Roman society. Pictures of the dogs that joined the Roman sports arena closely resemble the breed you see today. What many people don’t know, however, is that the modern dog breed is only the result of an attempt to revive the original breed. Like the wolf, which was almost wiped out sometime in 18th-century Ireland, these giant dogs themselves became extinct in an 1845 famine. The last of the survivors were reportedly mated with a Great Dane, a Tibetan wolf dog, a Scottish Deerhound and a Borzoi to ensure that the Irish Wolfhound bloodline lived on. When socialized early and adequately, this large dog breed makes a reliable pet. The pooch is in fact known for its gentility, sensibility and fondness for long sleeps. It does sport great potential for aggressive dog behavior though, so you must neither encourage nor provoke the dog to violence. Chasing instincts are very much hardwired in this dog breed’s system. Living Environment – These hound dogs thrive in chilly environments but don’t do very well in warm climates. These large and heavy dogs require an equally spacious abode to call home. Soft beddings are also necessary; otherwise, if you let your pet sleep often on the hard floor, they will likely develop calluses. Grooming – Expect average coat care work for this medium shedder. Combing their wiry coat is done on a weekly basis, while stripping of dead hairs is done twice a year. Trim the coat as needed for a neater finish, especially on the areas surrounding the eyes. Diet & Exercise – Free feeding is strongly discouraged as this dog’s health stays at the optimal level with twice-a-day feedings. To prevent overweight dogs, keep the protein content at 18 percent or lower. The breed cannot easily digest white rice and fish, so avoid serving these. When it comes to exercise, the requirements aren’t clear cut, so supervision is a must. Aim to strike a balance between the dog’s rambunctiousness and fragility. Overexertion can injure ligaments and bones, but inadequate exercise can spur destructive behavior. Supervised long walks on a leash are usually initiated on a day-to-day frequency. Health – For a breed of its size and history with hunting, you might think these large dogs were born to survive decades. In reality, many of them barely reach 8 years. The dogs are quite sensitive to anesthesia and are prone to injuring their tail, hips, bones and heart. As with many deep-chested breeds, bloat is a major concern. The Irish Wolfhound is intelligent, but because they are also very sensitive, harsh words and forceful training methods can easily ruin the dogs’ spirit. Positive dog training methods work best, using praise and rewards. Provide your pet enough companionship and praises, and you should be well be on your way to seeing some success in basic dog obedience training routines.